Ever since we started going out and I started cooking for him and asking him for ideas he’s asked me for panna cotta. I usually put it off due to its perceived ease. 6 years later, I thought it was about time I finally obliged. One morning before we headed off to the football I decided to whip up a quick batch of it. I kept it a surprise and wouldn’t tell him what I was making when he asked me. I was almost finished. I strained the mixture into a jug, left it to rest on the sink and turned away to find a safe place to rest the still hot pot it had cooked in. That’s when I heard it. The thud of the unattended jug falling into my sink. I turned in time to see almost the entirety of the mixture swirl down the drain. Maybe it was trying to tell me something. There was enough left for a small serving, so I dejectedly poured it into a mould and gave it to him for dessert. He reported that it was the best panna cotta he’d ever tasted. I don’t know if that made it better or worse. Take two happened a couple of weeks ago. Delicious, but it didn’t end up perfect and pretty like I wanted. So this weekend I embarked on take three. That’s what I get for sneering at this simple dessert. And I suppose the triple batch of panna cotta in the last month is exactly what Cam deserved for waiting so long. But don’t be fooled by my dose of karma. This is an incredibly simple dessert, and the result is ever so rewarding. So many macarons lately means so many spare egg yolks. And when there's egg yolks to use up there's only one possible solution: custard. Especially when your boyfriend loves custard a little more than he loves you. I'm totally cool with that. Custard is pretty amazing. Custard is especially amazing when it's in a crème brûlée. 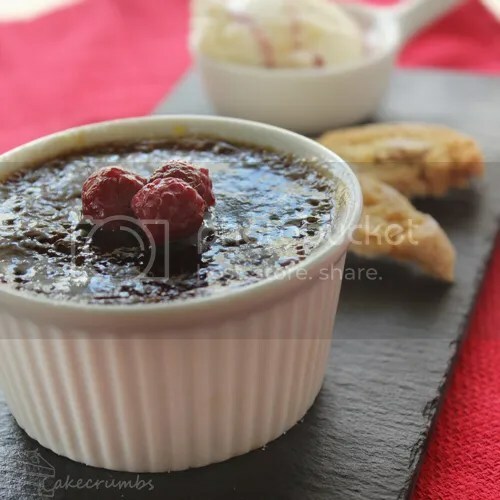 I love a plain crème brûlée as much as anyone, but I also love playing with the flavours. When I first started baking I used to follow all sorts of different recipes whenever I wanted a different flavour custard, but after some failures and some successes I discovered that altering a classic shouldn't mean altering the recipe. Start with a trusty blank canvass recipe and add a subtle twist. 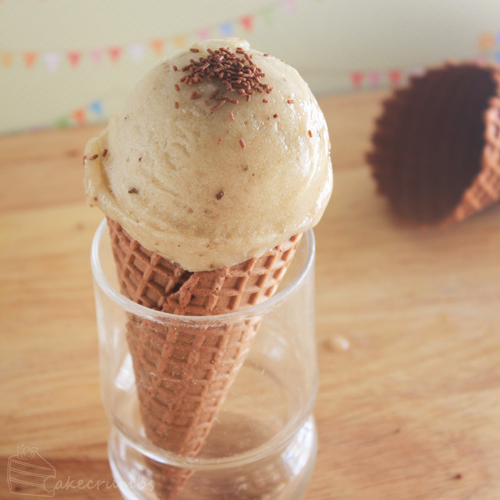 This twist incorporates two of my favourite flavours: coffee and chocolate. And the berry madness continued. 8.25 kg of strawberries required active searching for uses for them. A nice change, considering I'm usually I'm trying to hold back from devouring a whole punnet at once. The first thing that came to mind was this dessert. It's extremely berry hungry so it fit the bill nicely. It's something I've made a few times before, and posted the first time I tried it, but I've since been playing and perfecting this recipe so it was time to revisit it. 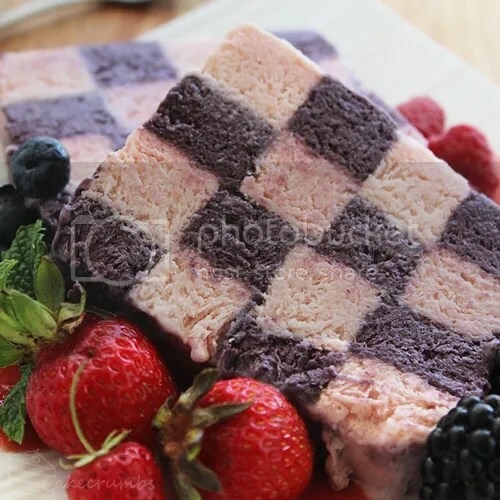 The beauty of this recipe is that it works with any berry you like. If the effort involved seems too much, you don't even have to make it chequered. You could marble it, or only make one flavour and freeze it inside a bar tin. It's completely open to interpretation. In my last blog, I mentioned the profound effect the deviantART community has had on my culinary art. One of the most significant impacts has been on the photography of it. Photos were always just snapshots of my food meant to illustrate my blog and my recipes therein. 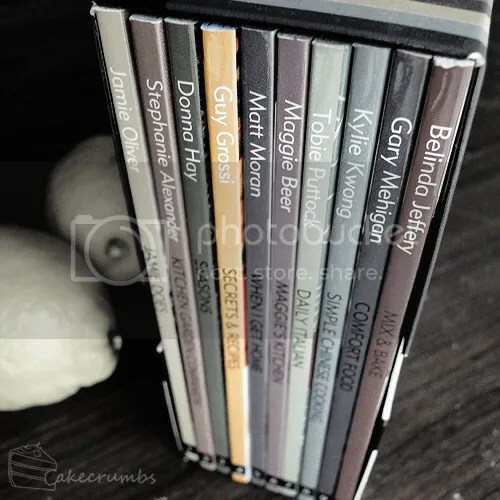 The amazing food photographers over on dA, especially those submitting their work to the same groups as myself, inspired me to want to make the photography art in of itself. Some time ago, I bought a book on food photography. It soon became obvious to me how little of what I learned I could put into practise with my point and shoot camera. So, right after Christmas, I decided to invest in a DSLR. I'm absolutely loving it and it is definitely one of my greatest investments. Every time I take it with me on a bushwalk, or on a bike ride with my dog, or take photographs of food with it, I am learning something new. This pavlova wreath was essentially the first photographs I took with my new camera, aside from a few random ones prior when trying to work out how to make the shutter work. These photographs are mostly me not understanding how to work my camera ("how do you photo?"). It's such a steep learning curve, but one I am excited about experiencing. As a baker, I get asked a lot what my favourite dessert is. Because I enjoy making the complex, most people seem to expect an interesting answer. Some intricate dessert, something complex feat of skill and beauty that is the epitome of perfection on a plate. A crisp meringue with a soft, marshmallowy interior. Topped with fresh cream and fruit, I would eat it every day without ever getting sick of it. Most of my favourite desserts, in fact, include fresh fruit. You just can't beat the perfection created by nature in the form of fruit. 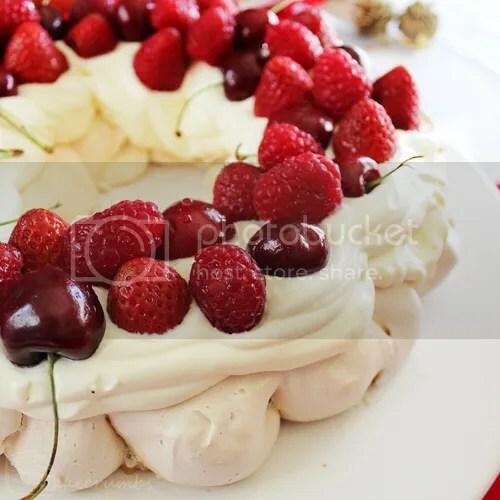 Pavlova is a staple at many celebrations in Australia and New Zealand. Such a staple, in fact, that most of us near faint from shock when those from other countries declare they've never heard of it!